← Nahariya – The North coast! Whilst I was on a break up north, I did one day of work just doing preventative maintenance and planning for back up power. 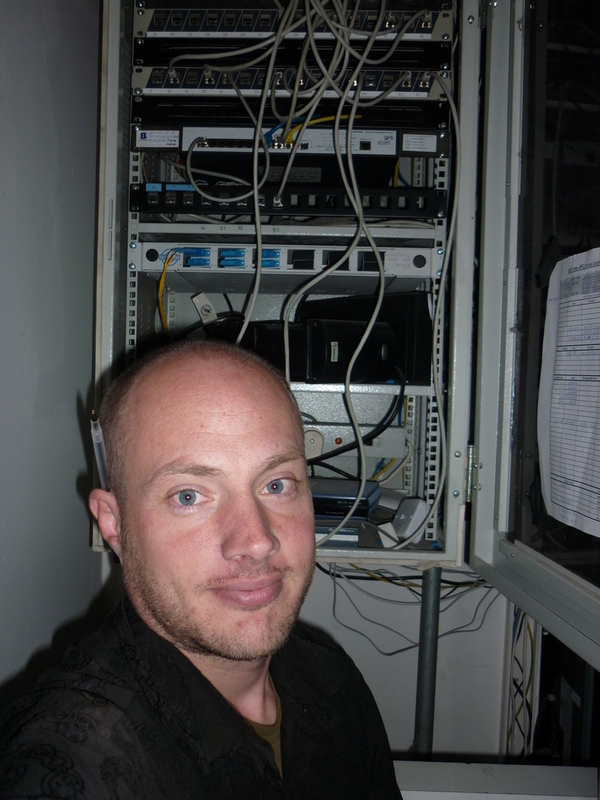 This cabinet has switches and routers for our Karmiel food bank. The top device sticks out and the cables protrude too much stopping the glass door from closing. 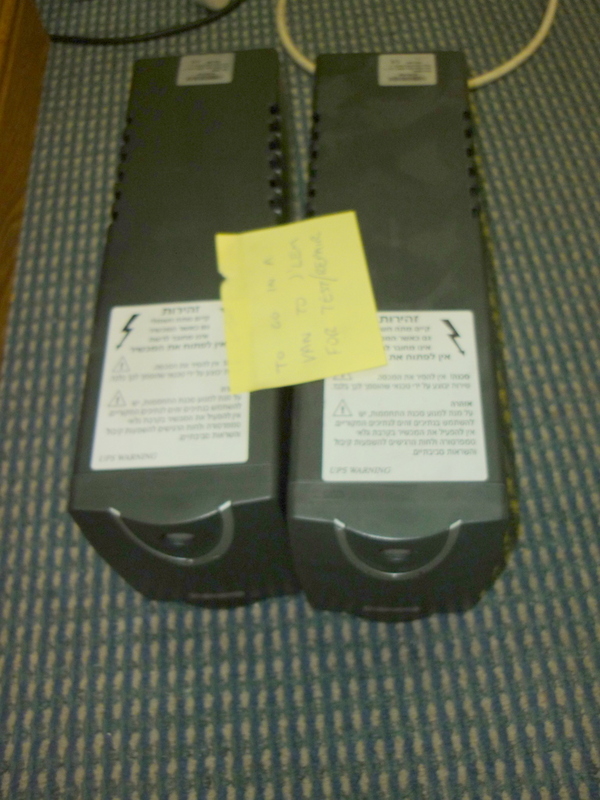 There are two UPS battery back up units here, some of these small shoebox sized units have not been reliable in other systems I have used and my guess the batteries which normally have a life of 3 years or so, probably need replacing. The server room sits down the corridor, I plan to do is to install a bigger UPS here and run all of this equipment here and the other room too. I need this week making diagrams on how the wiring for this is going to work. 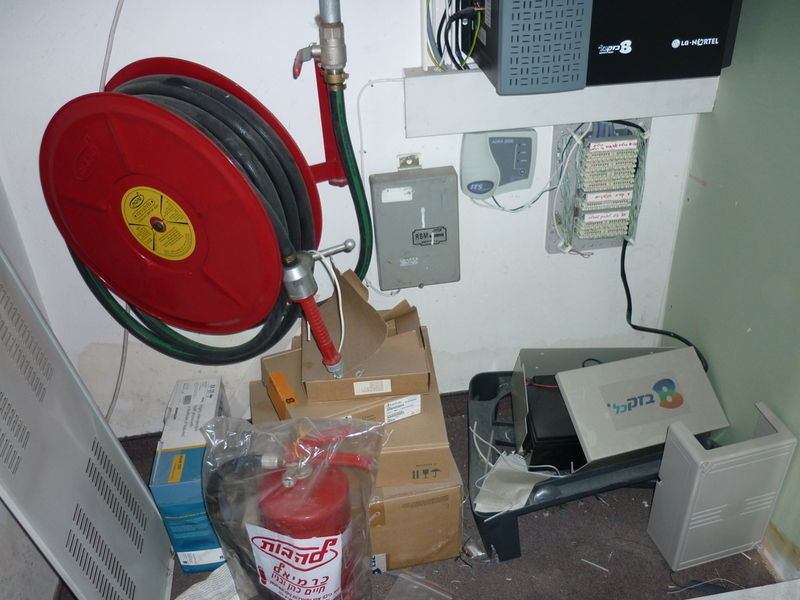 The electrical sockets in the computer room need to be labelled as ‘IT only’ as a vacuum cleaner or some other device with too much power will overload the system. The wiring closet will need to have all of this junk removed, but, there is a fire hose here, not the best place to have this.. The new UPS needs to have a network port, as I want to check its status 160Kms away in Jerusalem, as we are not at this site very often. Ideally I would like to see this item appear on my Spiceworks monitoring software. In the past UPS manufacturers like APC require it to be connected to a PC via serial port (hopelessly out of date) to check and monitor and issues with the power, and you have to pay extra for software. Spiceworks integration would make this great. Fixed a our server that handles back ups at this site, every once in a while this machine would turn itself off or crash. When I visited this site, I notice the power supply on the back of this PC has a fan not working, when poking it with a pencil it would not turn. I got a new power supply from a local computer store in town. I found some scrap batteries which were left from UPS devices that had been serviced with new batteries by the IT guy who was there before me. 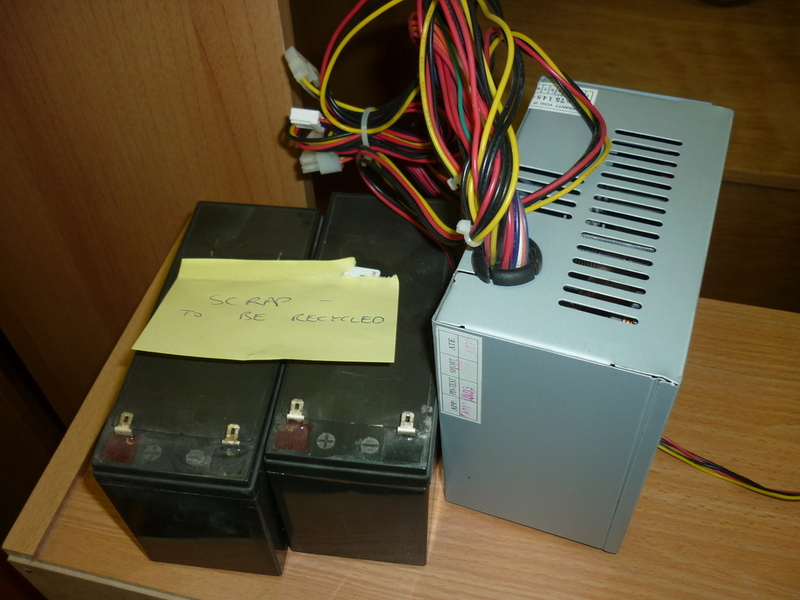 Left: Some UPS devices that are spare I need to bring back to be tested and possibly fit new batteries in. These are quite important as they are needed to stop spikes and brown outs in the power from cutting out the computers and other important equipment. Right: scrap stuff labelled to be recycled. I am not sure exactly where old batteries are supposed to be disposed of in Israel. It seems irresponsible to throw them in the bin as all batteries are highly toxic. I also done some tuning and updates of several PCs at this building, and set up Skype and a few other small jobs. I am really interested in the project of the Food Bank in Karmiel and I have seen you’ve been there. I haven’t been able to find where in the city it is situated. Could you maybe give me this location? That would help me a lot !